The Mid-Autumn Festival, popularly known as the Lantern festival in Malaysia dates back more than 3000 years. 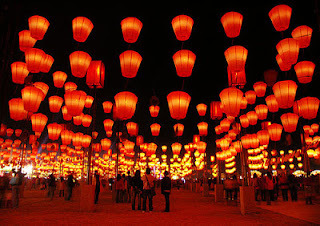 Historical records indicate that the festival originated during the reign of the Shang Dynasty in China. This celebration, a harvest festival associated with the worship of the moon, was given the name ‘Zhongqiu Jie’ meaning Mid-Autumn Festival, during the rule of the Zhou dynasty. Initially, the festival was the exclusive domain of Chinese Emperors who worshipped the moon as they prayed for a good harvest. The festival gained much popularity during the Tang Dynasty and then became an established celebration during the rule of the Song dynasty. The Mid-Autumn festival is usually celebrated on the 15th day of the eighth month of the Chinese lunar calendar, a day occurring around late September or early October and associated with the dawning of a stunning full moon. The Mid-Autumn Festival is celebrated in all over the Far East in countries like Malaysia, Singapore, China Hong Kong, Taiwan, Vietnam and the Philippines. The Central Market of Kuala Lumpur is the cynosure of all eyes during the annual Lantern festival for it is usually decorated with a multitude of colorful and brightly illuminated lanterns. Highlights of the festivities at Kuala Lumpur’s Central Market include a lantern procession, acrobatic performances and the presence of thousands of moon cakes, a traditional delicacy associated with the celebration of the mid-Autumn festival. Malaysian Chinese families also celebrate the festival at home by adorning their dwellings with lanterns and inviting friends and family for sumptuous dinners which feature moon cakes in various forms and flavors. Moon cakes are traditional Chinese pastries which are either round or rectangular in shape. These pastries which are similar to western mince pies served during Christmas feature a thin outer skin and are typically stuffed with a paste made of lotus seeds and salted egg yolk for the salted egg yolk is said to symbolize the full moon. 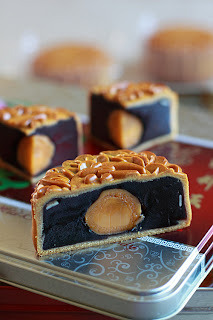 This traditional moon cake filling though delicious is excessively calorific and artery-clogging so nowadays moon cakes in their modern and more health-conscious avatar feature fillings like chocolate ganache, egg custard, date paste, green tea paste, water chestnut paste and more. Moreover in Malaysia, Halal moon cakes and moon cakes in flavors like Durian, yogurt, cappuccino and more are also common. Yet another contemporary version of the moon cake available in Malaysia and elsewhere is the ice cream moon cake or the jelly moon cake. Further moon cakes are usually adorned with Chinese language characters symbolizing traditional good wishes like ‘harmony’ and ‘longevity’ and are consumed with cups of green tea. 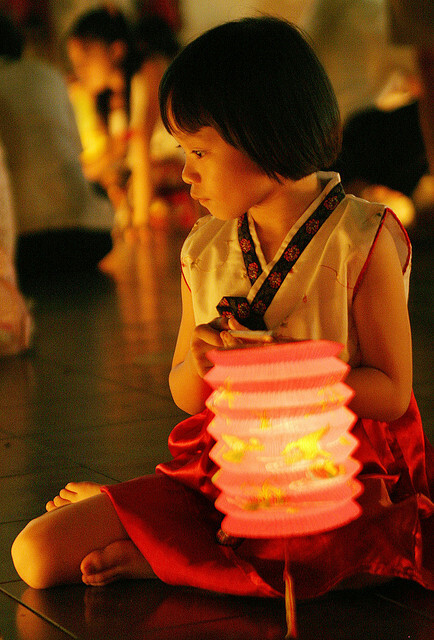 They are also gifted amongst friends and family for the celebration of the Lantern/mid-Autumn festival. Since the making of moon cakes is a labor intensive affair they are not made at home but purchased at store or markets. Moon cakes are a seasonal delicacy and are only made for the celebration of this festival. If the above has piqued your interest, so that you are curious about the taste of a moon cake, do plan a trip to Kuala Lumpur during its sparkling lantern festival and indulge in a moon cake or two.